Here is the statement by the Anambra State police command: “On the 21/3/2019 at about 2:40pm, one Okafor Ogochukwu 'F' of Osile Village Ogidi reported at Central Police Station Awka that on 19/03/2019 at about 11:36am, she was invited by her male Facebook friend, one Ifeanyi Azota 'm' to his house at Ezimezi village in Amawbia. All of a Sudden a woman who claimed to be his wife, namely Azotani Toochukwu 'f' suddenly appeared into the house with her friend, one Ogochukwu Nwankwo 'F' and Locked her inside the bathroom for almost four hours and left. The women later came back with two big canes and opened the bathroom. However, while the Suspect's friend, one Ogochukwu Nwankwo, stripped her Unclad and flogged her severally, the principal suspect was busy video-taping the incident and thereafter pushed her out from the compound Unclad. 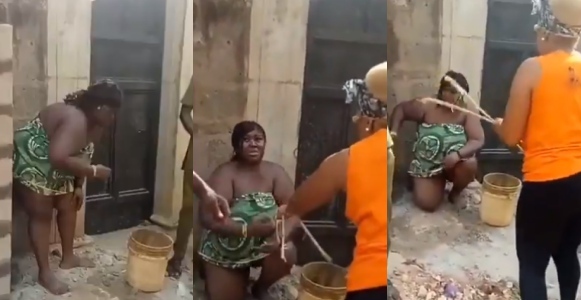 Consequently, when the Complainant refused to pay the money as requested, the principal suspect, Azotani Toochukwu, actualized her threat and posted the Unclad video to the internet and since then, the video went viral. Meanwhile, three suspects have been arrested and the scene of the incident was visited by Police detectives attached to Central Police Station Awka. The case under investigation after which suspects would be charged to Court for prosecution.